This past Sunday, September 10, Adler and a few dozen fellow travelers rode on one of those cat café trains. 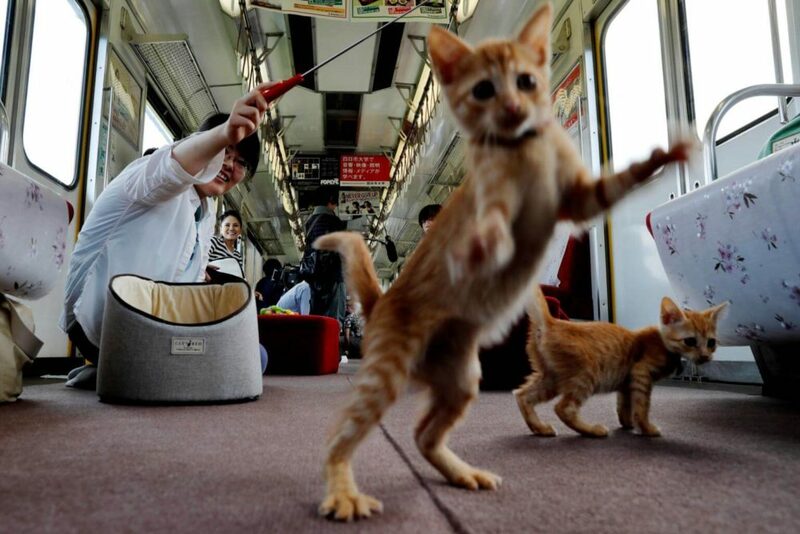 They were joined by about 30 rescue kittens, which spent the trip climbing the legs of besotted passengers, running back and forth on train benches, and napping on laps. Adler traveled about 90 minutes outside of Tokyo to hop this train, which left from the small city of Ōgaki. He is quite familiar with cats—he has one himself—as well as with his adopted country’s love for cat cafés, in which patrons drink tea and eat cookies while surrounded by felines. Quite well, it turns out. Unlike the older, often lazier cats that lend stationary cat cafés a lounge-like atmosphere, the train kittens were in perpetual motion. “They were so light and little and curious about everything,” says Adler. Three kittens circled one woman for nearly the entire ride, clambering all over her. Another passenger spent hours cradling a tiny black cat to his chest. The cat train was a collaboration between a local NGO, called Kitten Cafe Sanctuary, and the train’s owner, Yoro Railway Co Ltd. The NGO hoped to promote stray cat adoption, while the transportation company aimed to jumpstart tourism to Ōgaki and the destination city, Ikeno. To this end, the ride offered other amenities—free food; views of mountains and meadows; a bathroom break halfway through.